Roasted tomatoes add sweet and rich flavor to this vegetarian caprese spaghetti squash recipe. Basil and mozzarella top off the fresh flavors. Thanks to DelCampo for helping me to share this recipe with you. “The sum is greater than the parts? I don’t get it.” Since it was our older son asking the question, my husband explained it in his language…soccer terms. A group of 11 really good soccer players are just that individually…good. When you put them together, they can become something fantastic, even legendary. Caprese salads are the culinary equivalent of the same concept. Sweet tomatoes on their own…great! Fresh mozzarella cheese…you guessed it. Great. Basil…yeah, great. Put them altogether and drizzle with a fruity extra virgin olive oil and balsamic vinegar. Since I am somewhat smitten with the caprese flavors, I try to work them into quick breads, meatballs and even frittatas. Even spaghetti squash wasn’t safe from my obsession. The key to any good caprese is ripe, sweet tomatoes. 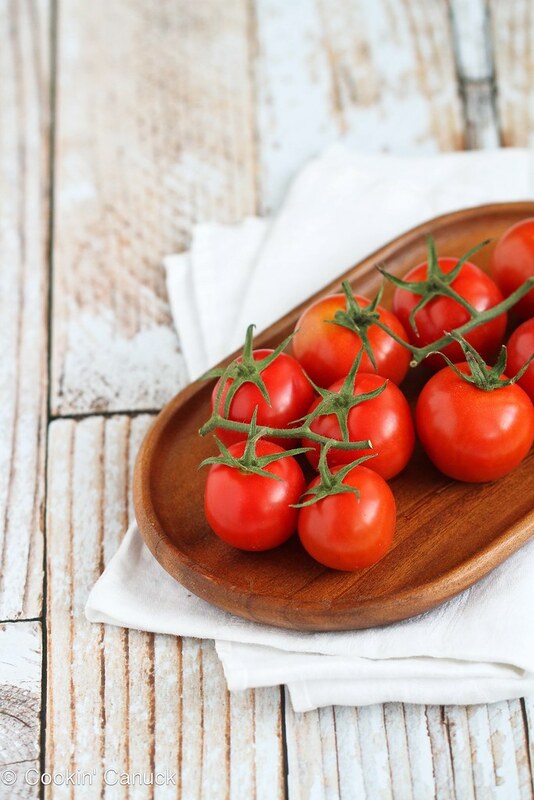 DelCampo recently introduced cocktail tomatoes called T’mates. They are sweet, juicy and perfect for stuffing as an appetizer. That is, if the t’mates last that long. It’s so tempting to pop them straight into your mouth one a time, which we did with about 20 of them in under 10 minutes (I’m not kidding). 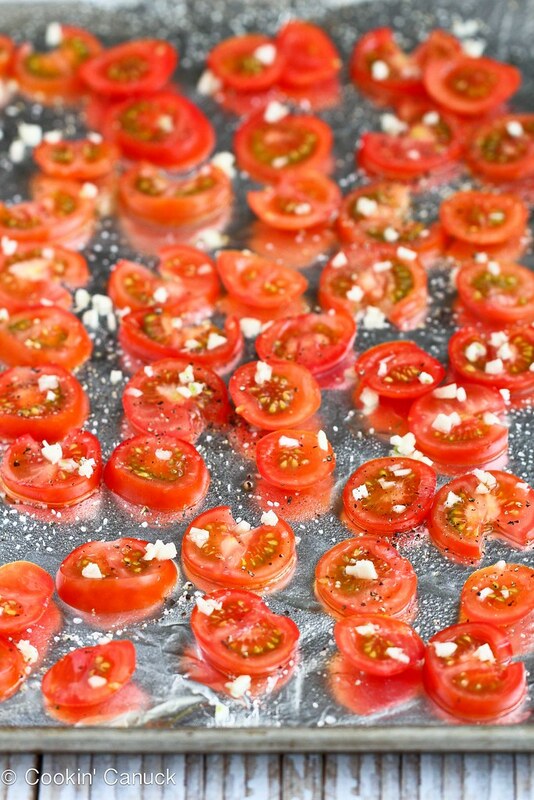 The tomatoes became even sweeter when roasted with olive oil and garlic. Be prepared for your kitchen to smell incredibly good for several hours! The whole process takes only 15 minutes, during which time you can be cooking the spaghetti squash in the microwave. While we ate this caprese spaghetti squash as a meal, it would make a great side dish for your next backyard barbecue. If you are looking for the T’mates in your supermarket, they are sold in recyclable cardboard containers, each holding about a dozen tomatoes. Disclosure: This post was sponsored by DelCampo for helping me to share this recipe with you. Caprese Salads are my idea of summer! So fresh and flavour packed! I love tomatoes in salad! This recipe looks awesome! I love tomatoes. Hey, this looks really good. I’ve added it to my vegetarian list of recipes. Thanks a bunch. Excellent idea! I’ve never used fresh mozzarella in pasta before. This looks amazing. I love tomatoes on pasta or actually anywhere. I made this last night, added spinach and fresh mozzerella, delicious ! That looks delicious. I wouldn’t get mine to look so pretty! I needed a good recipe to use my last spaghetti squash. The addition of spinach is a great idea Lori! Sounds so good; I am all about Caprese salad when it’s summer! My husband and I LOVE spaghetti squash so I am always on the lookout for new recipes. This looks delicious! Yum! 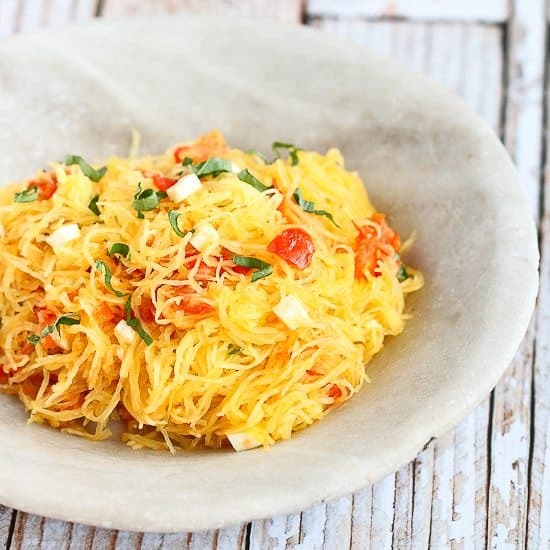 Love replacing pasta with spaghetti squash! I have only used spaghetti squash for dessert. I guess I need to try it in a savory dish to see if I like it. This is the perfect light meal for our hot summers! These T’mates look so delicious! And I love the size! And your vegetarian caprese spaghetti squash recipe looks and sounds divine! Thank you for sharing! This recipe looks real good, thanks for posting it! I like tomatoes in a homemade salsa. Perfect recipe for summer ! Um, YUM. Found this recipe on Pinterest and now I can’t wait to try it. I love Caprese, and I love Spaghetti Squash, but I never would have thought to combine them. Can’t wait! I love spaghetti squash. This dish looks great. This looks AMAZING! I love spaghetti squash, and pairing those awesome tomatoes with it just takes it over the top! This looks wonderful! I’m definitely going to make it! This recipe looks fantastic! Can’t wait to try it out! That looks great I love spaghetti squash! 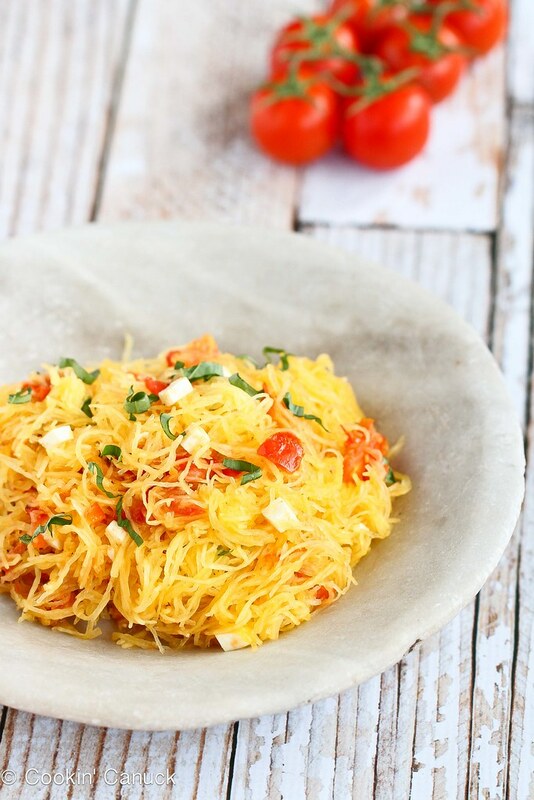 I’ve never tried spaghetti squash before…will most definitely try to hunt some down today! 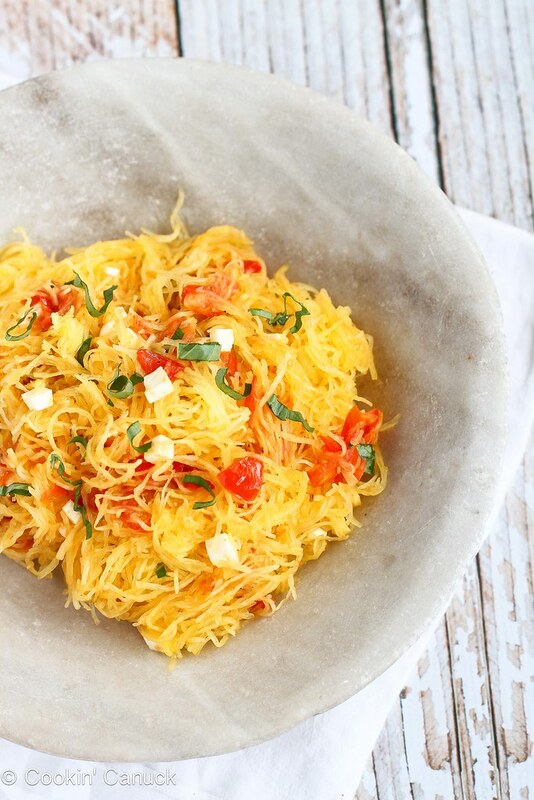 I’ve never tried spaghetti squash before…will need to hunt some down today! I must try this recipe. Low carb and vegetarian! I LOVE spaghetti squash – there are so many goodies you can add. Can’t wait for them to come in season! MMMM, this would be a perfect way to use up the spaghetti squash that is still sitting on my counter! I love that you roasted the tomatoes- sooooo good! This looks great! I’m going to the store today! I love tomatoes fresh off the vine! Now I have some dinner ideas for tonight, since the spaghetti squash is already prepped and cooked in my fridge. I love spaghetti squash and am always looking for new ways to prepare it since it is kind of bland on it’s own. This recipe looks like a winner! Looks delicious and so healthy! Thank you! 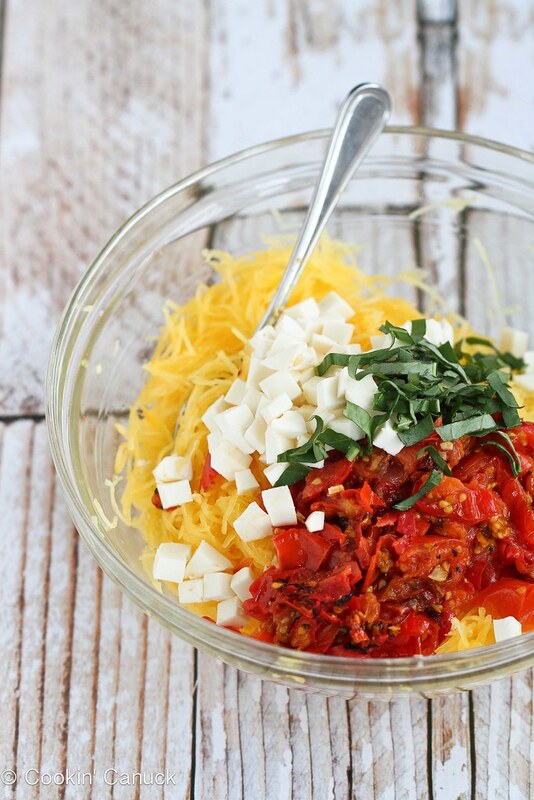 Your Caprese Spaghetti Squash recipe looks good enough to eat!! It looks amazing! And that picture of just the tomatoes cut up with yum on it- I want! I am a fan of spaghetti squash and your recipe looks good and healthy. I’m all about anything caprese 🙂 never had spaghetti squash but can’t wait to try this! Looks delicious, healthy, and summery! Can’t beat caprese! I love spaghetti squash and can’t wait to try it this way. Thanks for sharing. Caprese and spaghetti squash?! My favorite low carb spaghetti dish just got madeover for summer! This looks absolutely wonderful! Perfect for summer…..
Looks yummy!! Can’t wait to try it! I’m always looking for new things to do with Spaghetti squash – the idea of mixing in some caprese is simply inspired! Can’t wait to give this one a try. This looks amazing. I love spaghetti squash! I would love to be able to cook food that looks that good. Spaghetti squash is an amazing vegetable! I love cooked tomatoes and the fact that this is gluten free is even better! I love spaghetti squash! And thanks for the great giveaway! I am ready to try this recipe–looks really tasty!! Great way to use the summer tomatoes! And I’m nuts about spaghetti squash too – awesome recipe! Great photo (so colorful! ), and this recipe sounds delightful! This looks really fantastic! I’ve had spaghetti squash with marinara before, but hadn’t ever thought of using it like this, dying to try it! This is a great alternative to my favorite Caprese salad! This is one I want to try. oh my goodness! I love this recipe! so light and healthy. . great for summer! can’t wait to try it! Love the caprese flavors with spaghetti sauce! I recently tried spaghetti squash for the fist time and I am hooked! I’ve never tried spaghetti squash before, but this might be the recipe that pushes me to do it! One of my favorite ways to enjoy spaghetti squash! I love tomatoes in my salad! Ooh, I love caprese too. Might have to try this! can’t wait to try out this recipe! it looks amazing! This looks delicious! I love the idea of mixing up a classic caprese with spaghetti squash. Thanks for the giveaway opportunity! This looks so good. Wish I were cooking it right now! <3 spaghetti squash! This pasta looks so good! Yum! Now I know what I’m going to do with the spaghetti squash I have. I haven’t had spaghetti squash in a while but this makes me want to get some. Beautiful photos! You make this look so easy and yummy. Recipe looks delicious as always!! Me and my 2 year old both love spaghetti squash. I cannot wait to try out this recipe. This looks great! Maybe it’ll be the recipe to give me the push to finally try spaghetti squash. You are so ingenious! What a healthy low calorie way to make delicious pasta! I’ll definitely be trying this during the summer. I love spaghetti squash! Oh that looks so good! I have never tried a spaghetti squash! I have to try this! I love tomatoes! This dish looks so light and delicious!! This recipe is making me hungry. Thanks for the giveaway. Spaghetti squash is my favorite squash and I am always looking for new recipes. This is a to-die-for recipe. Thank you so much for sharing & I have pinned it to try out on my family. Yummy! That recipe looks delicious – I can’t wait to try it. I love the variety of veggies…will be adding this to my meal plan for sure! Looks delicious! I love spaghetti squash and tomatoes!